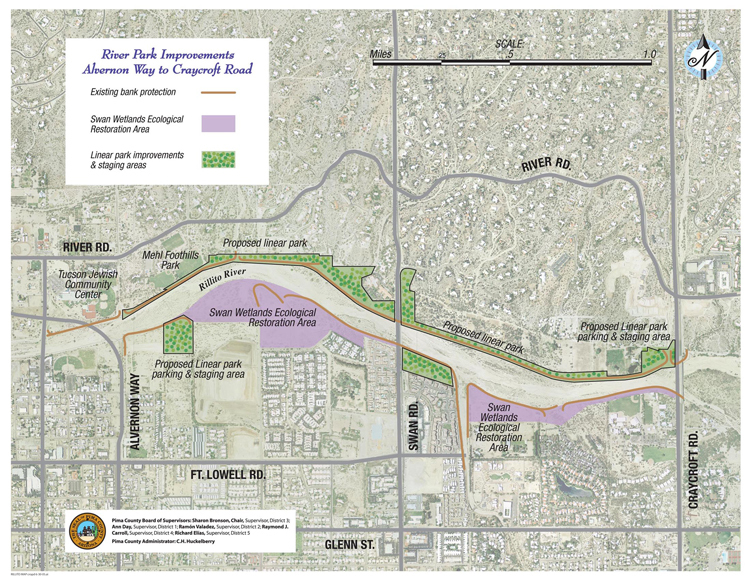 The Pima County Regional Flood Control District and Natural Resources, Parks and Recreation departments will combine their efforts to construct a linear park on the Rillito River from Alvernon Way to Craycroft Road. The proposed park improvements will include facilities to accommodate jogging, inline skating, walking, equestrian and photography activities. The existing flood control improvements (soil cement bank stabilization) will be enhanced by additional asphaltic concrete-paved paths, decomposed granite soft paths, landscaping, parking, restrooms and public art. Access between Mehl Park and the new Rillito Linear Park will be improved. Mehl Park is located within the project limits on the north bank of the river between Alvernon Way and Swan Road. Drainage and trail improvements will provide the needed access between the two parks. The Swan Wetlands Restoration Project and El Rio Antiguo Project are separate United States Army Corps of Engineers and Pima County Regional Flood Control District projects and both located within the Rillito Linear Park project limits. The Swan Wetlands Project is a habitat restoration project and El Rio Antiguo is a combination recreation and ecosystem restoration project. The linear park improvements will enhance the priorities of both projects by restoring and increasing the native vegetation in their areas. The Divided Urban Pathway system will consist of two separate paths (Asphaltic concrete and decomposed granite) on each bank of the river. The asphaltic concrete path (hard) will be 12 to 15 feet wide and will follow along to the soil cement bank. The decomposed granite path (soft) will be 10 to 12 feet wide and will meander away from the bank as the right-of-way permits. Throughout most areas of the park, the two paths will be separated from each other and will only connect or merge into a single AC path at the pedestrian bridges. There will also be some areas where there is insufficient rights-of-way to accommodate two paths. Vegetation within the proposed linear park will separate into two paths and the park boundaries. Water conserving native plants will be irrigated with reclaimed water that will maintain healthy and vibrant growth year round. Proposed vegetation will include trees, shrubs, cactus, succulents and groundcover. The highest density vegetation will be located on both sides of the soft path. This will provide shade and habitat for birds. Landscaping will also be used in the staging areas along the boundaries and the smaller pocket areas adjacent to the paths. The proposed park improvements will include two park staging areas. A staging area includes parking and restroom facilities, drinking fountains, sidewalks, informational kiosks, seating and picnic facilities. Landscaping will complement the features in the staging areas and accentuate the mountain views. Both staging areas will provide a circuit trail to accommodate all access needs. The first staging area will be located east of the new Alvernon Road Bridge (currently under construction) on the south bank of the river. Vehicular access to this staging area will be off the newly constructed Paradise Falls Drive. The second staging area will be located west of Craycroft Road on the north bank of the river. Access to this area will be from the first driveway north of the Craycroft Road Bridge. The remaining vegetation at this location provides the perfect setting for bird watching or just relaxing. An equestrian staging area is currently located just east of Swan Road on the south bank of the river. This facility will be enhanced with landscaping. Equestrian access into the wash will be maintained by the existing ramps that are spaced at 1/4 mile increments on alternating banks. Equestrian access into the major side washes entering the Rillito River will also be accommodated under the pedestrian bridges. Public art will enhance the linear park and draw a focus to southwest culture. Multiple artists will develop a common theme for the park from the local culture. The historic Fort Lowell District is close by and serves many possibilities. Mehl Park pedestrian bridges and even the soil cement stabilized bank provide the perfect pallet for public art. This project has been completed, thus no meetings are currently scheduled. The following meeting details are for information only. The Pima County Regional Flood Control District (District) held a 2-day Public Workshop to discuss development plans for the Rillito River Linear Park Improvements. April 20, 2005, 6:00 p.m. to 8:00 p.m.
April 23, 2005, 10:00 a.m. to 12:00 p.m. The survey results from the public workshop meetings held on April 20th and 23rd are available. Thanks to all who attended. We will keep you updated when more information is developed.